The latest version of Dual Writer, version 2.1, contains several new features that make transcription easier. This upgrade is available at no charge to existing users. The new Speed Control allows the media player playback speed to be adjusted from half speed up to double speed. This is particularly useful for transcribing fast speech. By reducing the playback speed it’s possible to catch words that might not otherwise be understood. The Dual Writer Media Speed Control lets you slow down playback for faster and easier transcription. Another use of the playback setting is to slow down the audio enough so that you can type or use speech recognition to transcribe, and keep up with the speaker. So rather than typing faster to keep pace, you can just slow down the speaker. You’ll find it’s no longer necessary to pause as frequently, or playback passages you couldn’t get the first time. The Timestamp options in Dual Writer give you complete control of the look of your customized timestamp. Another new feature in version 2.1 of Dual Writer is Timestamp configuration. 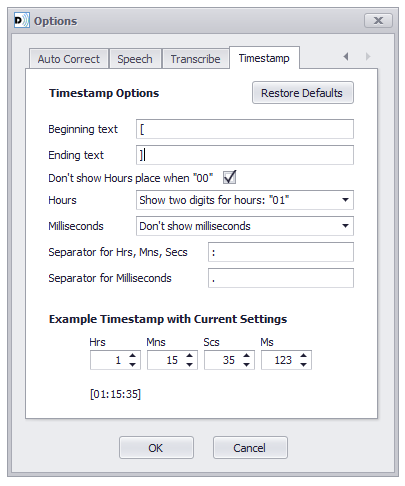 The Options dialog box now has options to change the Timestamp to meet virtually any requirements. You can specify text before and after the time, and set the characters that separate the hours, minutes and seconds. Version 2.1 also includes minor bug fixes. To download the latest version of Dual Writer and try it out for free, just visit the download page. This entry was posted in Announcements by Brad. Bookmark the permalink.